Sapporo offer a unique dining experience with all the theatre of Teppanyaki style cooking. This is a great location to meet new people. Sapporo Teppanyaki is a lovely restaurant with superb food. Due to it's great success and reputation of quality, it has expanded and gone from strength to strength. 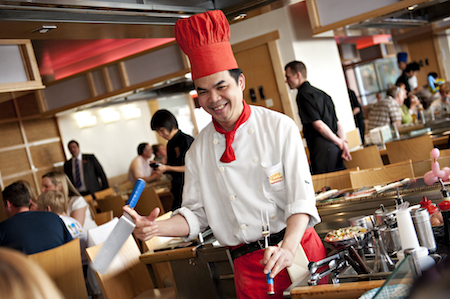 Here at Social Circle we love to find you the best and latest at top locations and Sapporo Teppanyaki is no exception. Sapporo Teppanyaki is a lovely restaurant with superb food. Due to it's great success and reputation of quality, it has expanded and gone from strength to strength. Here at Social Circle we love to find you the best and latest at top locations and Sapporo Teppanyaki is no exception. Sapporo offer a unique dining experience with all the theatre of Teppanyaki style cooking - be entertained by the talented show chefs and enjoy authentic Teppanyaki cuisine and sushi at its very best. The menu covers everything from steaks to duck, chicken to lamb, and, as you'd expect for a Japanese restaurant, an exciting array of seafood including sashimi and sushi.